Last week, we roasted tomatoes and made an easy summer pasta. This week, we’re going to roast tomatoes and make a fresh tomato soup. Between living in Florida (a state known for its lack of seasons) and growing up in the ’80s and ’90s (two decades that aren’t exactly known for an emphasis on real food), seasonal eating was a very foreign concept to me for quite a long time. I first learned about “seasonal eating” from Michael Pollan (my real food hero). The idea that many vegetables and fruits aren’t year-round foods, despite the fact that most grocery stores carry such produce year-round, was eye-opening for me. What do you mean tomatoes, broccoli, and apples don’t grow year-round? There are seasons for these foods? Over the years, I’ve tried to embrace seasonal eating to the best of my ability. Instead of purchasing apples all year, I (usually) wait until the fall and winter, when the price of apples drops because they’re plentiful and in-season. We don’t grow apples in Florida (I wish), so I still rely on shipping methods to enjoy this fruit. My goal isn’t 100% local, seasonal food; instead, my goal is to simply be more intentional about what I purchase and when I purchase it. I still purchase some out-of-season produce, but I try to dedicate the bulk of my produce choices to in-season veggies and fruits. 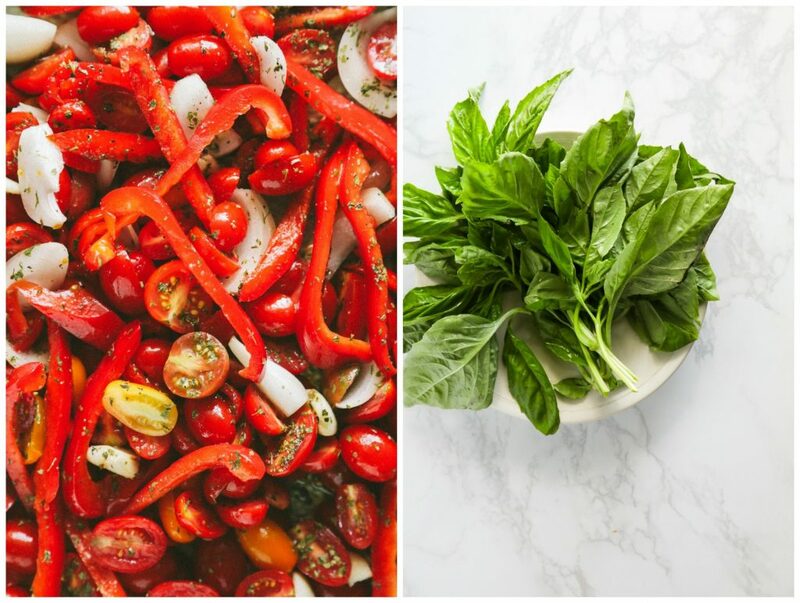 Besides the flavor and nutritional benefits, in-season produce is incredibly affordable compared to out-of-season produce options. This means it’s important to know how to prepare and enjoy a variety of vegetables (and fruits). Because when we know how to prepare a variety of veggies (and fruits), we’re far more likely to pick up the chard or pattyman squash and feel confident about preparing and enjoying it. This, my friend, is why mastering basic cooking techniques (like roasting, simmering, and sautéing) is so important. With these techniques, we can transform any vegetable into a delicious meal. This is also why I’m currently obsessed with the book, Salt Fat Acid Heat. Today’s recipe starts with seasonal tomatoes, because in most parts of the country tomatoes are in-season during the summer. 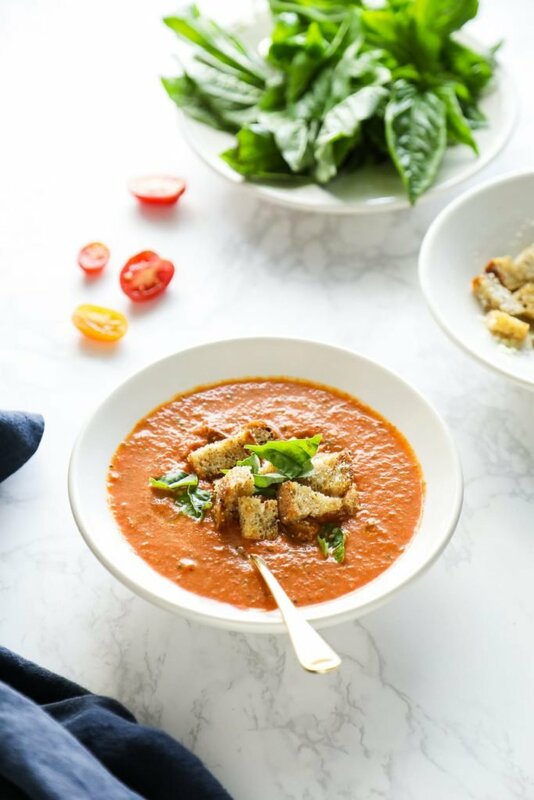 Using a simple cooking technique, roasting, the tomatoes are transformed into a juicy and slightly-sweet base for a fresh tomato soup. Red pepper is added to the tomatoes to provide an extra flavor boost, too. 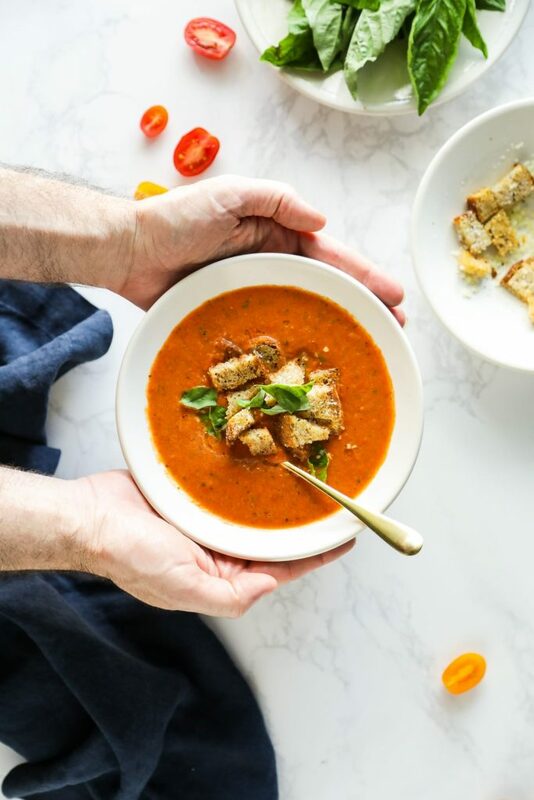 Once the tomatoes and red pepper are roasted, they’re blended with nourishing broth, fresh basil (a summer-loving herb), and a touch of milk to cut through the acidity of the tomatoes. 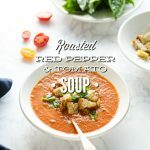 Since tomato soup and fresh bread (or a grilled cheese) go hand-in-hand, and since the oven is already hot, I like to make homemade croutons to sprinkle over the soup. The croutons add just enough crunch and heartiness to a smooth and light seasonal soup. 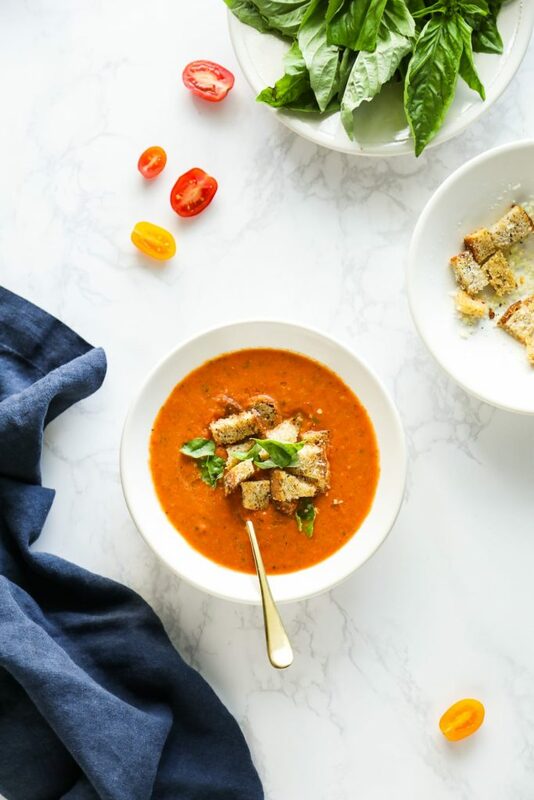 A seasonal soup featuring roasted red pepper, fresh tomatoes, basil, and nourishing broth. 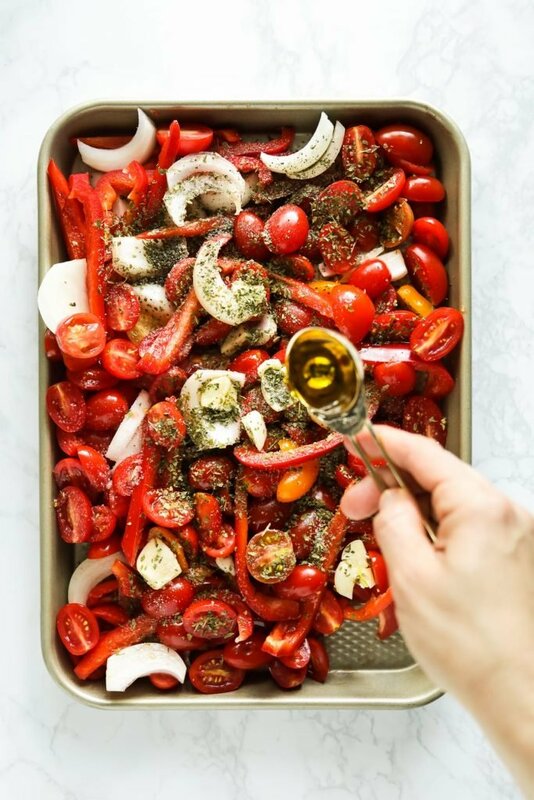 Arrange the tomatoes, red pepper, yellow onion, and garlic on a sheet pan. Sprinkle the oregano, parsley, salt, and pepper evenly over the veggies. Drizzle the olive oil evenly over the veggies, and toss everything together with your hands. Roast the veggies for 40 minutes, until the veggies look shriveled (and the tomatoes are cracked on the skin) and soft. Reduce the oven to 375F. Toss the bread squares in the olive oil and spread them on a baking sheet lined with parchment paper. Parchment is optional if your baking sheet doesn't have an issue with food sticking. Sprinkle the bread with a pinch of salt. Bake until the bread is crispy, or about 15 minutes. Sprinkle the cheese over the crispy croutons. Gently toss to cover the croutons with the cheese (you'll probably need a large spoon-they'll be warm to touch). Add the broth and tomato paste to a soup pot (or Dutch oven) on the stove-top. Whisk to combine the broth and paste. Over medium-high heat, bring the broth to a slight boil. 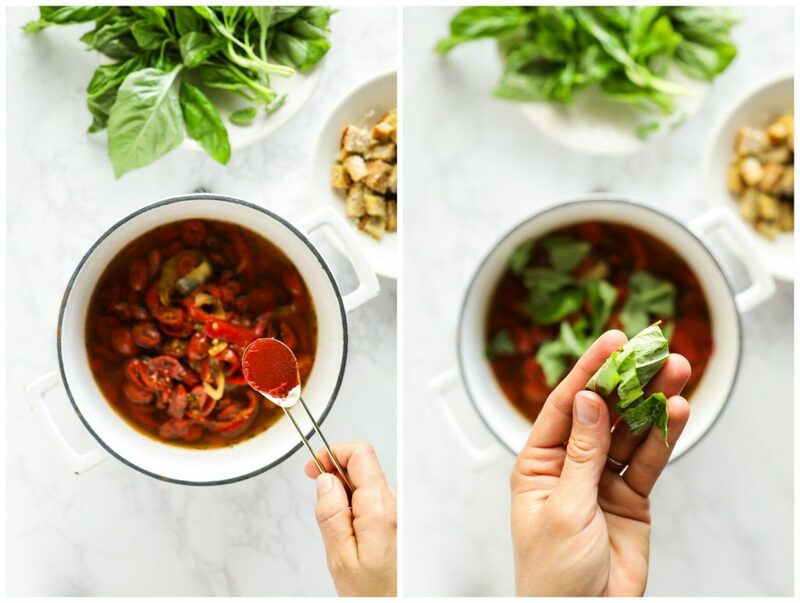 Once the broth is warm, add the roasted veggies and basil. Use an immersion blender to puree the ingredients into a blended soup (there will always be some little pieces in the soup). 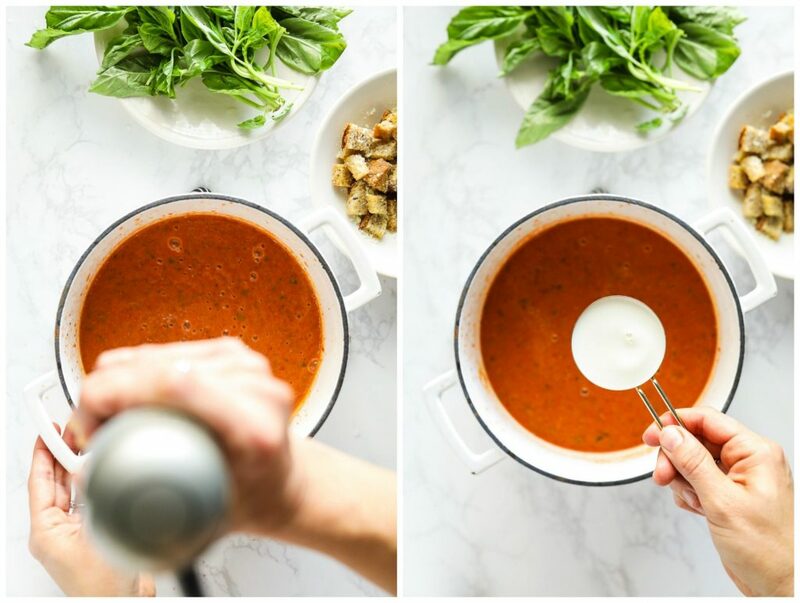 You could use a high-speed blender instead of an immersion blender for a smoother soup. The soup should be hot at this point, but if not continue to cook it on the stove-top until it's hot. Finally, stir in the milk. The milk helps balance the acidity of the tomatoes. Taste the soup and add more salt, if needed. Spoon the soup into a bowl(s). Add a few parmesan croutons to the top of the soup. Garnish with extra chopped basil and black pepper, if desired. Hi – do you think this would freeze well? Hey Tara, I think so. I would leave out the milk (or cream) and add it once you defrost and heat the soup (just a tablespoon or two if you’re freezing small serving-size mason jars). This recipe is awesome! I made it once to eat right of way and again to freeze. After defrosting, I will add the basil and cream. Great idea, Alice! I’m so glad you’re enjoying the soup! I just made this to use up garden cherry tomatoes. I also had half of a butternut squash so I cubed it and roasted it with the other ingredients. Since I don’t have an immersion blender, I used a traditional blender to blend batches of the roasted veggies and then wisked that into the broth. Since I had a little more veggies, I used two cups of broth. It is so delicious! I think the squash sweetened up the recipe enough that the cream wasn’t even necessary (but I used it anyway since I had it!) Thanks for the recipe!